Say “oil” to TV fans and we think of long-running drama Dallas (1978-1991 & 2012-2014). 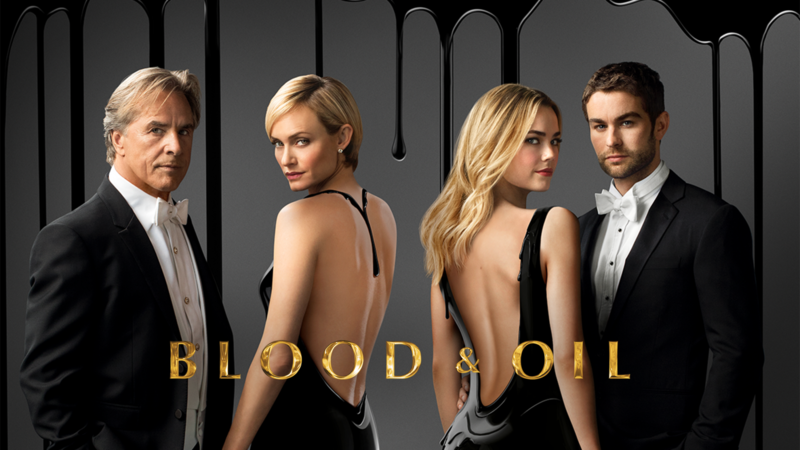 But while that series focussed on oil-slick tricky boardroom backstabbing, the new series Blood & Oil (2015, now on Showmax) gets down in the dirt as billionaires like the Hap Briggs (Don Johnson) and his son Wick (Scott Michael Foster) wrestle the competition for stakes in a new oilfield – sometimes literally. Will there be blood? Will one guy drink another guy’s milkshake? Yes and yes. It’s the like Wild West or the Gold Rush out there on the North Dakota oilfields. But during any rush, the name of the game is to stake your claim, then claim everyone else’s stake. And the more crooked you are, the quicker you can do that. Leading the pack is double-dealing no-good Hap Briggs. Cheating is a way of life for him. “He’s a larger-than-life character, billionaire, wildcatter, river boater gambler kind of guy,” explains actor Don. “As happens in a lot of families where there’s a lot of money, entitlements run rampant. That’s part of what he’s dealing with, with his son. His wife Carla (Amber Valletta)… I’ve known a lot of these billionaires and they have the wife. But they also have four or five dalliances on the side,” he adds. “One guy I’ve known for 25 years – It’s not all that hard to figure out, I can tell you that – is a lot like Hap Briggs. I sort of took him and pieces of all the other folks that I know and I started to build this character.” Don isn’t naming names though. “I gotta protect the guilty!” he jokes. So much for the old guy. But Hap doesn’t get to have things his own way thanks to desperate newcomer Billy LeFever (Chace Crawford). This newlywed working man with a baby on the way will do anything to make that first dollar – which he’s hoping will be the start of an easy million dollars. “He’s a real adult, so it’s a new thing for me,” laughs Chace. “He’s very ambitious and really wants to be a player, but when he and Cody [his wife, played by Rebecca Rittenhouse] come into money for the first time in their lives, the question is: will that draw them closer or pull them apart? Will Billy be tempted by a pretty face? He’s a young guy and there are going to be some bad decisions, some fights on the home front.” He doesn’t sound like much but by the end of episode 1, it’s obvious that Billy has a knack for spotting a deal, getting in on the action fast and he can take on Hap at his own game. Just don’t ask him to drive you anywhere (he crashes his car twice during the first episode alone).